President Trump’s nominee to the Supreme Court is a radical choice at a pivotal moment. A wave of alarming executive orders from the White House has spotlighted the importance of preserving our independent courts. Yet at this moment of urgency, President Trump has nominated to the Supreme Court a radical-right judge who fails dismally to pass this test. My colleagues at the Alliance for Justice and I predict the American people and Senate will reject the nomination of Judge Neil Gorsuch. Less than two weeks after Inauguration Day, the nation is confronting what some lawmakers call a constitutional crisis over Trump’s ill-considered travel ban. It’s hard to pinpoint a time in recent memory when there was a greater imperative for impartial judges to exercise an independent check against presidential excesses. Enter Judge Gorsuch of the US Court of Appeals for the Tenth Circuit. His record lacks evidence demonstrating he would vote to check a strong-arming president. It reflects substantial evidence that if his egregious views were to become law, Americans’ lives and health would be put at risk in untold ways. Gorsuch would make the courts a rubber stamp for large corporations. He advocates legal views that gut protections for clean air and clean water, safe food and medicine, for workers’ rights and for consumers and investors. Indeed, on ensuring the federal government can properly enforce critical legal protections, Gorsuch is more extreme than the man whom he would succeed, Justice Antonin Scalia. 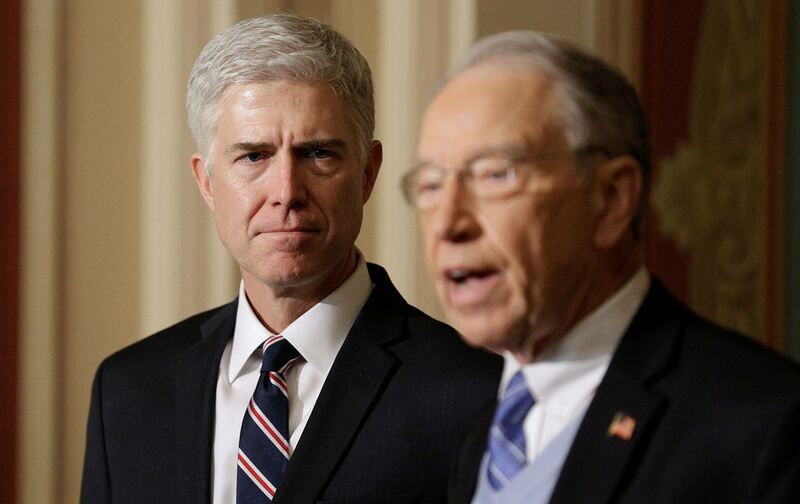 Like Scalia, looking backward is Gorsuch’s lodestar. He has demonstrated hostility to women’s right to reproductive-health care, siding with Hobby Lobby Stores in a decision that corporations are people and can refuse birth control coverage to their employees on religious grounds. That decision’s implications have expanded as some judges applied it to justify failure to comply with child labor, anti-kidnapping, and anti-discrimination laws. On women’s right to have an abortion, Gorsuch has not written a court opinion. But Trump vowed to appoint an anti-abortion justice, and he knows Gorsuch’s beliefs well. On other fronts, Gorsuch has written decisions in favor of protecting police officers who use excessive force and against shielding the rights of students with disabilities. He has also written decisions that are hostile to reasonable environmental regulations. Before becoming a judge, Gorsuch showed himself to be a good friend of big business, not consumers and workers, when he advocated limiting the ability of Americans to band together to hold corporations accountable for harms they caused. He also argued for making it harder for victims of financial fraud to sue the corporations that defrauded them. Today the Supreme Court, philosophically divided and shorthanded with eight justices, is at a pivotal moment. Its one vacancy is long overdue to be filled. Three more justices will be in their 80s in Trump’s first term. Given Trump’s tactics to disrupt Washington and a surge of legal challenges in response, the fairness, impartiality, and independence of our highest court has rarely been more at stake. After getting nearly 2.9 million fewer votes than Hillary Clinton, Trump has no mandate for an extreme-right takeover of the Supreme Court beginning with confirmation of Neil Gorsuch. Although we recognize the uphill battle ahead, we pledge a mass mobilization. Thirty years ago, the Alliance for Justice made the same pledge when President Ronald Reagan nominated Judge Robert Bork. The Senate ultimately voted “no.” Today, our campaign opposing a lifetime appointment for Gorsuch will draw on the inspiring strength of the Women’s Marches and the protests at airports on behalf of refugees and immigrants denied entry to the United States by Trump. Our campaign also will draw on the facts. When Senate Republicans refused even to hold a hearing on President Obama’s nomination of Judge Merrick Garland to the Court last year, it was unprecedented in modern history. We support holding a hearing on Judge Gorsuch, a full vetting of his nomination, and a chance for the American people to listen to testimony from all sides. We are confident Americans will conclude that, to avert a disaster, Donald Trump will have to find an alternative nominee who is unflinchingly independent; who recognizes the progress made in our nation over the past 100 years; and who when seated on the Court will take the American people forward, not backward.